…I guess! This Christmas will be remembered for many things but one of them surely will be what is now resting snugly in a purple brace, yes purple (I guess they had no other colors!) – that would be my shoulder! 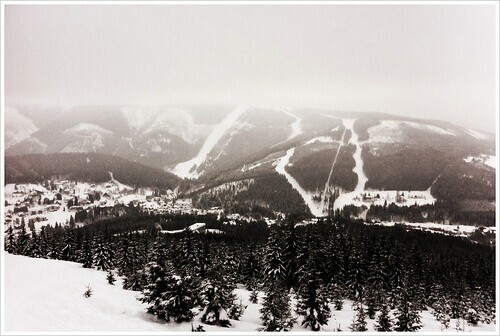 Earlier this week I ventured north to the Great Mountains (a.k.a. Krkonoše) with the abominable snowman (see evidence below), I mean my dear friend and director, Billy Crossan, for our almost annual pre-Christmas ski trip. They day was going great. I was enjoy the beauty and the opportunity to worship God as a got my shred on! Then the unexpected of all unexpecteds happened! I FELL! Even though I don’t get on snow 5-6 days a week as I did when I was a kid, I can’t just go out and be a “recreational skier,” that’s not fun for me. I enjoy speed, good hard turns and occasionally flying through the air! Well, to keep the story short, I was cranking out a turn over a small roll of the hill, when my binding released on me as I left the ground. Needless to say, it’s hard to land on one ski going 30-40 mph, I tried to pull it out, but when my skiless boot barely touched the ground I went flying into the air once again, with all my weight coming down on extend arm – BOOM – first dislocation (besides fingers, which I fixed on my own!;-)). 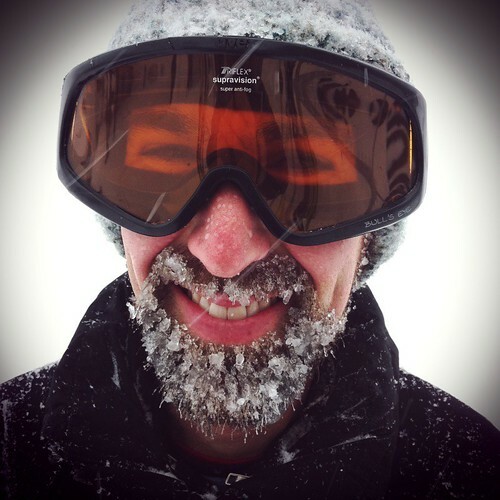 Our ski trip came to an abrupt end, as I was taken to the town’s medical center. The doctor and his staff did an amazing job caring for me and after an x-ray they popped it back in and it looks like I should be good to go! Hopefully no surgery and just three weeks in the brace. I won’t be on snow any time soon, but I’m thankful it’s not more serious. So I guess I gave myself an early Christmas gift a purple brace, some awkward situations with just my one hand and little pain! MERRY CHRISTMAS ME! 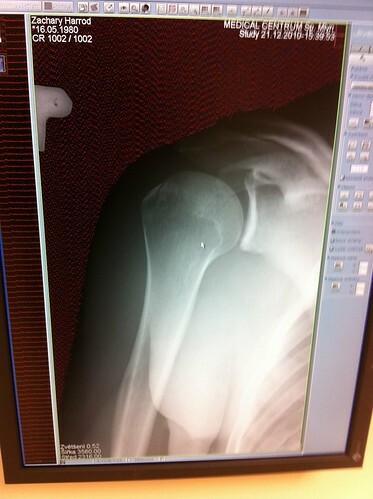 Here’s the corrected shoulder, I can’t get the pic of the x-ray of it dislocated, but I’m happy this looks right! 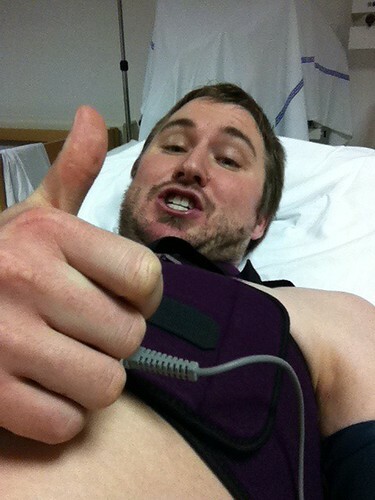 Here is me celebrating the relief of having my arm back in it’s proper place! I had hoped to fire out another zhtv episode for this Christmas, but sadly because of my “accident” it didn’t happen, so you can enjoy a couple past Christmas zhtv episodes! MERRY CHRISTMAS!